Whilst digging flowerbeds several years ago, I found this lump of concrete buried in the ground. It's an old fence post support from long ago. Garden "Lump", the early years. I always liked it's round domed shape and the way the smooth river rock was exposed on the surface of the concrete. I decided I liked the way it looked standing on end. (Part of it was aesthetic and part of it was not wanting to have to carry it to the car and dispose of it.) So, I plunked it down in the flowerbed and forgot about it. 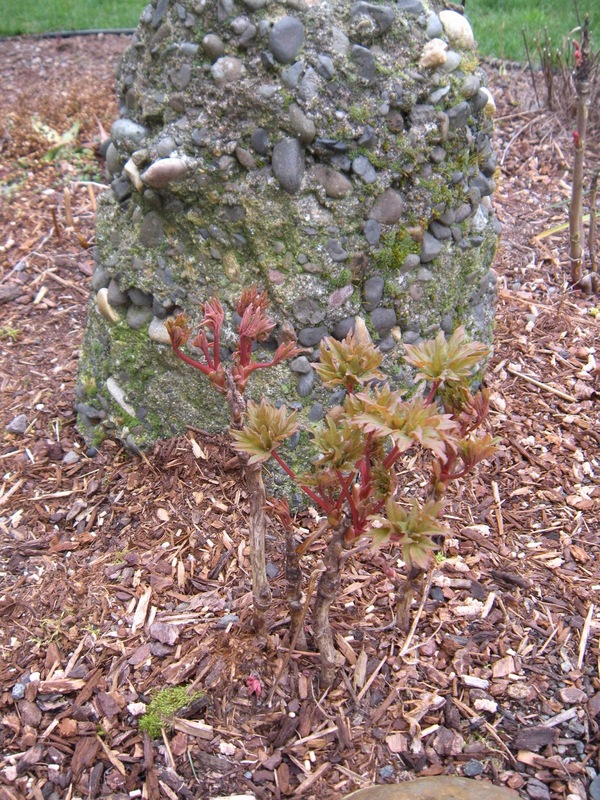 My Garden Lump is nestled between several peonies, so it almost disappears in the summer. Now its just busting out with fuzzy green moss and feels so alive. Isn't it great to take something ugly and re-purpose it? Very pretty with little gems of pebbles as well ! Brilliant! I love your mossy lump. You've got a very impressive lump! (And I don't just say that to all the guys!) Very pretty!